Stratton previously went by the name of Stratnoid, which was founded in 1860 as a knitting needle company. The company changed its name to Stratton and began producing compacts in 1923, importing components from the US. By 1930, Stratton produced all of its own compacts in its factory in Birmingham, England. At this time, the company held a 50% share of the UK’s cosmetics industry. Kigu was also an English compact company known for their quality, design and innovations from the 1940-70s. Click here for history and catalogs of Kigu. 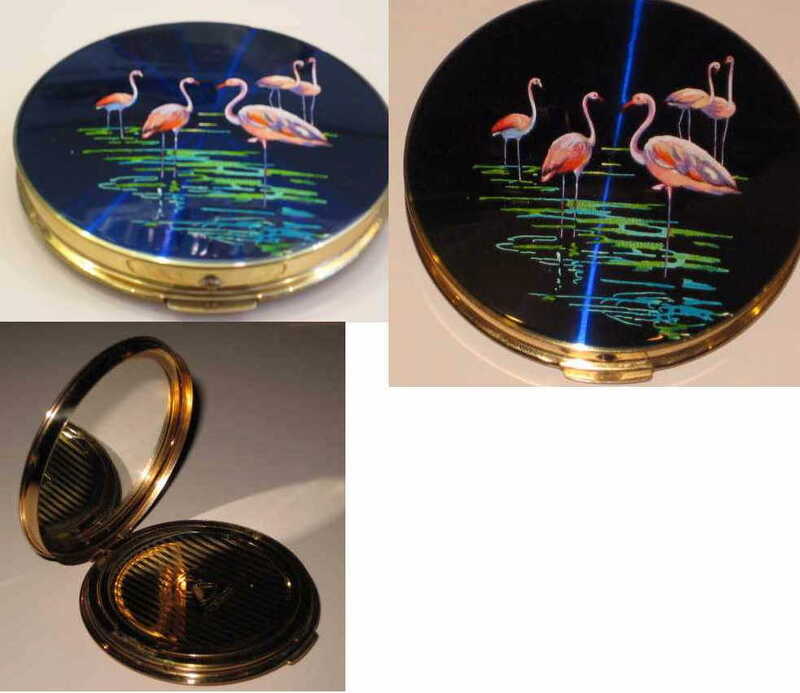 3" round gold tone with shiny enamel lid with pink flamingos! They are standing in water. Nice detailed scene. I couldn't get rid of the camera flash! It's known as the Waterbird series from 1959. The back is gold tone. The inside has the mirror on one side and the opposite side has the lift up section for loose powder, no puff. It's marked Stratton on the inside lift up section. Very pretty Stratton. 2-3/4" round gold tone unused compact by Kigu. The top has an ornate etched design all over and there is an original applied silver thistle with marcasites in the center. The back has a line design. The inside has a mirror on one side and the opposite side has the lift up section for loose powder, with signed puff. No damage. Nice looking compact! 3-1/2" oval gold tone with scalloped sides unused Kigu compact. The front has a beautiful enamel scene with flowers and horse pulling a flower cart! The back has a line design. The inside has a mirror on one side and the opposite side has the lift up section for loose powder, with signed puff. It doesn't snap closed, but displays great! 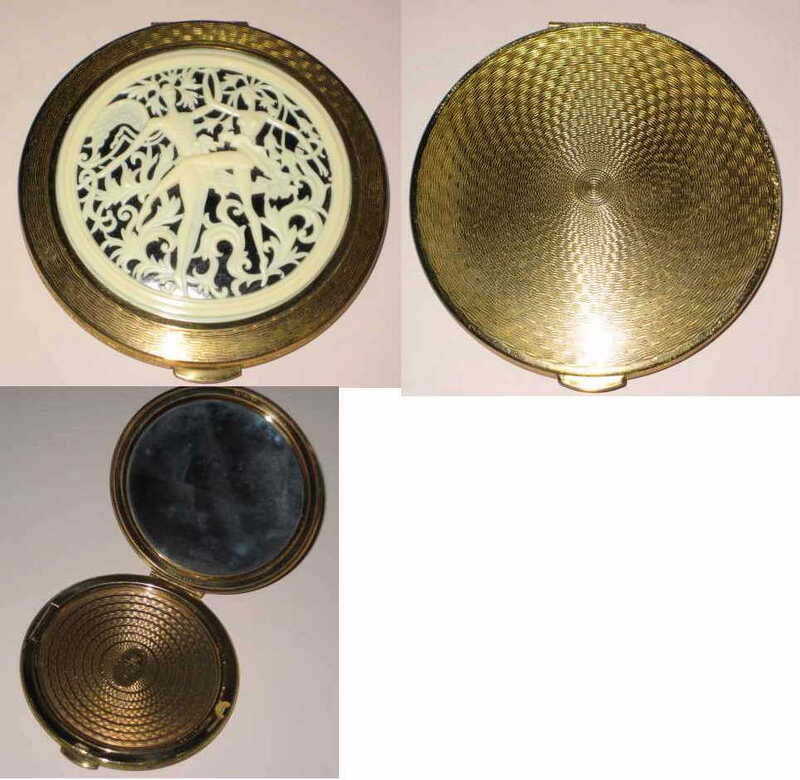 2-3/4" square gold tone compact with black plastic lid with brassy cut out of a London scene. Very detailed with buildings and scrolling. The back has a line design. The inside has a mirror on one side and the opposite side has the lift up section for loose powder, no puff. Signed Kigu. Nice souvenir compact from the 1940-50s. 3-1/2" round brassy unused Kigu compact. 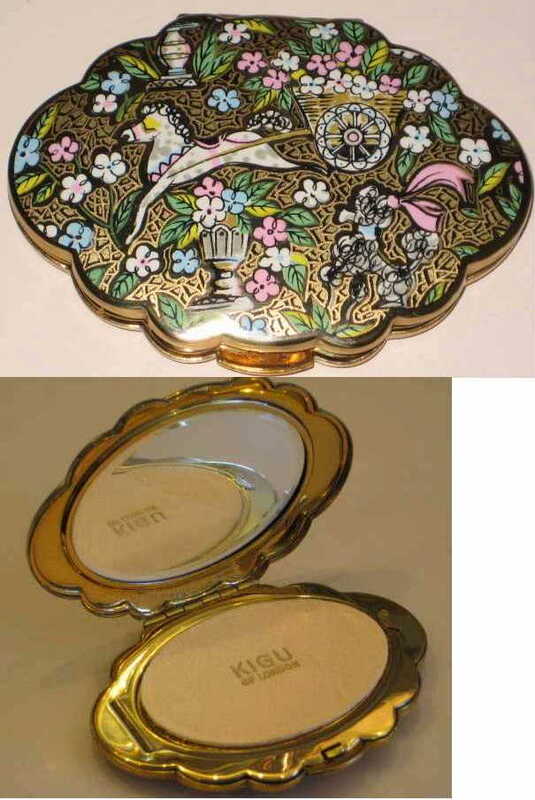 The lid has a cut out ivory colored celluloid scene of a couple dancing. Very ornate with scrolls around them. The back is a line design. The inside has a mirror on one side and the opposite side has the lift up section for the loose powder, with signed puff. Great condition! From the 1940-50s. 3-1/2" round brassy round Dexter compact, looks just like the Kigu above. 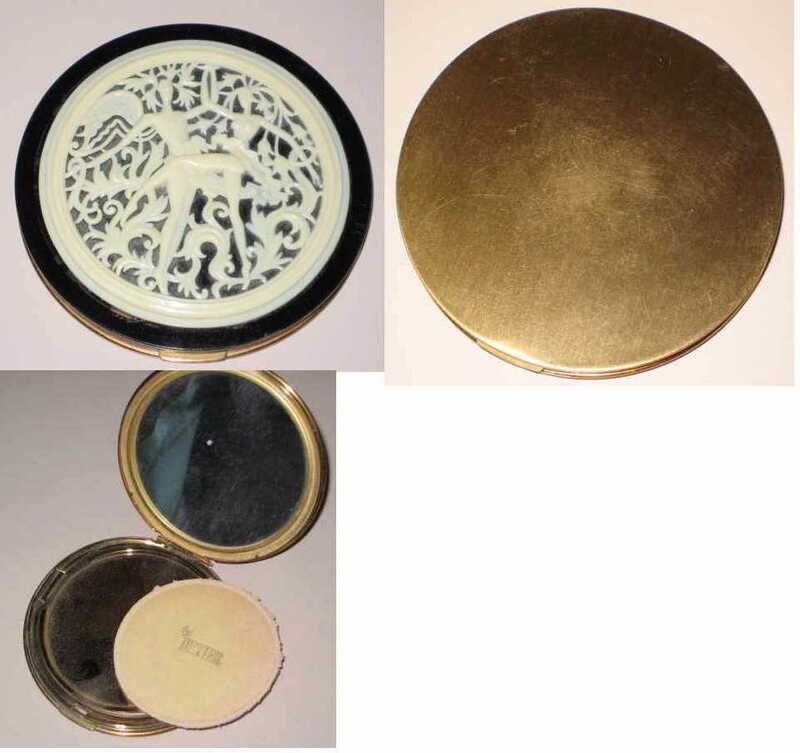 The lid has a black enamel border with a cut out ivory colored celluloid scene of a coupld dancing. There are very ornate scrolls around them. The back is plain. The inside has a mirror on one side and the opposite side has the lift up section for the loose powder, with signed puff. Barely used. Nice looking 1940-50s compact.